Cover of Oy, Elephants! ... coming soon! The Story Behind the Story: Oy, Elephants! I am often fascinated by where story ideas originate, so I thought I would share how the idea for Oy, Elephants! came about. I was reading a news article one day about the upcoming retirement of the Ringling Brothers circus elephants. There were some very serious aspects to the article, including the welfare of the elephants and what was in their best interests. But on a less serious note, I confess I was more than a little tickled by the notion that the elephants, like so many humans before them have done, were retiring to FLORIDA! In fact, my very own grandparents, once upon a time, had done just that, retiring to Delray Beach. I have always had a special affinity for elephants. For many years, I have collected elephant knick knacks and been interested in elephant issues and conservation efforts. Some little clouds began to collect in my brain, just wispy at first. Elephants, retirement, Florida, grandparents ... they floated around, slowly crisscrossing and forming into an idea. What if the circus elephants retired to Florida, and not to an elephant conservation center as in real life, but to a Florida retirement village? How would the elephants be received by the residents? What predicaments would evolve from elephants in a retirement village? How would my own grandparents have reacted to these unlikely neighbors? I liked it! In fact, I liked it quite a bit. I feel it adds depth and believability to a story when the characters have some basis in real life, and for this story, my very own grandparents seemed the perfect muses. My Grandma Gussie was a strong influence in my life, bestowing on me a deep love for animals and a strong sense of family, and always setting an example of kindness and caring. 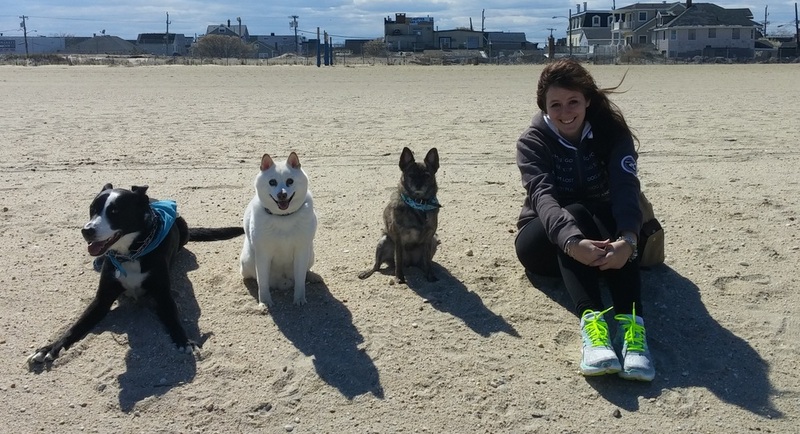 She made friends easily and everywhere she went. She had a unique way of making each person feel special, welcome and cherished. She was a phenomenal cook, who delighted in feeding those she loved. And, well, she was a little bossy, but in the best possible way. My Grandpa Morris (though he spelled it Maurice, he pronounced it Morris), was a born grandpa--stuffed with patience and fun, always up for an adventure, and never tired of playing with the grandkids. The sillier the game, the better. I remember him standing on a piece of wood, sliding down a hill in the snow with us, just because we asked him to do it. He opted to walk instead of drive whenever possible, more on principle, though he was not the best driver. He was curious, loved to learn and share stories. He said a lot of funny things (not always on purpose) ... single lines that, upon recitation, can still bring family members to tears of laughter. And he had a heart of gold. I considered how my grandparents would react to elephants moving in next door, and the answer was clear to me--they'd welcome them with open arms, make them feel right at home, and of course invite them to dinner. And so the story unfolded. 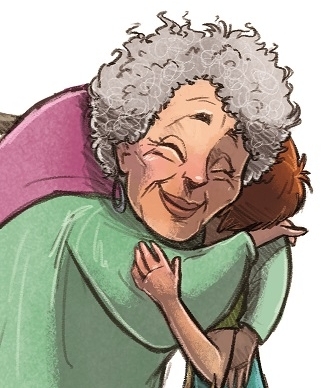 I wanted to showcase the relationship between grandparents and grandchildren, and so the main character evolved, named for my youngest cousin, Joel. The grandkids often went to visit my grandparents. In later years, the great grandkids went along. Staying over was always a special treat, filled with fun activities, grandma's offerings of all our favorite foods and grandpa's stories, games and his infamous egg creams, which he served in tiny A&W root beer mugs. I imagined young Joel, excited to see his grandparents, but worried he might be a little bit bored as the only kid in a retirement village full of seniors, and how he might react if some elephants moved in next door. 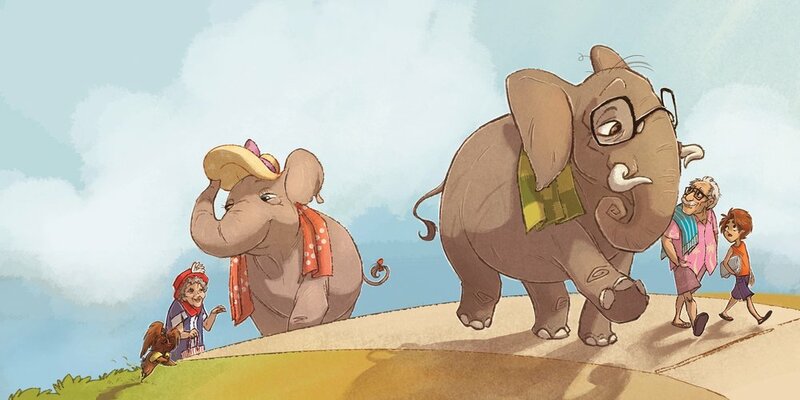 I had a great time talking with my aunt (mother to Joel, the main character's namesake) about what Gussie and Morris might do with the resident elephants and what adventures they might share. We reminisced and laughed, and little by little, the details and events fell into place. In fact, there are aspects of the story, including some of the specific dialogue, that are drawn directly from real life. As a result, the story is rich with memories for me, of two of my very favorite people. Because I have a deep appreciation for the magnificent creatures that are elephants, and a strong desire to see them survive for future generations to appreciate, I also wanted to take the opportunity to teach children a bit about them, and about how to help ensure their future. In the back of the book is a section about elephants, encouraging children to learn more. Additionally, a portion of the proceeds from the book will go to charities that protect elephants. I also hoped to share a meaningful message. Though a family of elephants may be unlikely to move in next door, we live in a diverse world where it is easy to fear or shun those who are different from us. This story explores the things we have in common and how those things can bridge the differences that separate us. It reminds us that we all bring unique gifts to the party of life, and that extending a hand in friendship can make all the difference to others, as well as add richness and depth to our own lives. Finally, as a tribute to my wonderful grandparents, who were such an anchor, inspiration and source of unconditional love and acceptance for me, my siblings and my cousins growing up, I wanted to share the very unique and precious relationship of grandparents and grandchildren. To envision a wonderful grandpa like my own reading Oy, Elephants! to a grandchild at bedtime brings a special smile to my heart. As always, Morgan Spicer's remarkable illustrations take the characters and story even beyond my own best imaginings. She has included a wealth of tiny details that add fun and nostalgia. My incredible editor, Krista Hill of L Talbott Editorial, was invaluable in helping me develop the story and tell it in the best possible words, and maybe most importantly, in giving me the confidence to believe it was a story worthy of telling. My aunt Iris, not only supplied so many of the ideas for the details of this story, but shares so much of the real history that gives the story its heart and warmth. And my wonderful publisher, Aperture Press, added the polish to the story and are tying the pictures and words together just so with a pretty bow on top as we speak. I cannot thank all of them enough for helping me take my wispy clouds of an idea and turn them into a book!